Mulching in the fall doesn’t just serve to protect gardens from the winter cold–it can actually achieve all of the benefits of spring mulching and more. When experienced gardeners think of mulching season, spring typically comes to mind. Mulching in the spring helps to replace what has been broken down in your garden, retain moisture in the soil, protect gardens from weed growth, and prevent erosion. But mulching in the fall doesn’t just serve to protect gardens from the winter cold–it can achieve all of the benefits of spring mulching and more. Many landscaping professionals regularly practice mulching in the fall, and depending on the landscaping needs, may prefer fall mulching. Here are some pros and cons of mulching this fall. Cool Weather: It can get hot out in the spring, and working outdoors all day in the garden works up a sweat. Taking on something laborious like mulching when the weather is milder will be easier on you and make for a pleasant day of gardening! Time-Saver: Fall mulching can save you significant time in the spring when most gardening tasks tend to pile up. Taking care of a big task like mulching in the fall will prevent you from having to go through the process during arguably the busiest season for gardeners. 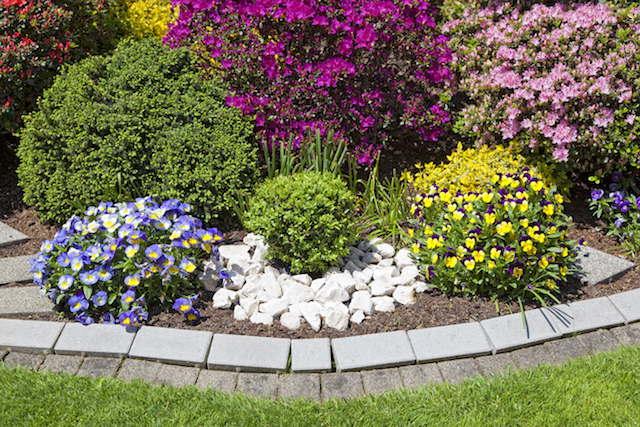 Best of all, your garden will already be prepped to prevent erosion, weed growth, moisture loss and more when spring comes around. Avoid Shoots and Bulbs: When you mulch in the fall, you avoid a lot of the pesky issues that come with a spring mulching. There’s no need to avoid bulbs and shoots from perennials in the fall, and you save time by cutting your perennials back to help create a fresh bed for the spring. That’s another task you can remove from your spring gardening to-do list. Enjoy Your Garden Before Winter: Getting out into the garden in the fall will give you more time to enjoy your outdoor space before the winter comes and puts an end to the gardening season. No Self-Sowing: If you grow self-sowers in your garden, mulching in the fall will interfere with their germination and growth in the spring. Time Constraints: It can be difficult for many gardeners to find a weekend in the fall to take care of a task as big as mulching. It can also be a concern for early winters–if you don’t get all your mulch out in time, it could wind up under a blanket of snow. Perennials: A big part of mulching in the fall is cutting back perennials to apply mulch evenly. If you like to keep your perennials around through the winter, mulching in the fall may not be for you. This entry was posted on Friday, September 28th, 2018	at 3:19 pm	and is filed under Landscaping Design	. You can follow any responses to this entry through the RSS 2.0	feed. Both comments and pings are currently closed.